Has it really been a year?! Too much has happened and I have no excuses for not blogging. Well, apart from dealing with everything life throws at a person, of course. (And the fact I forgot my password log-in.) So, time for a catch-up methinks! I hadn’t talked much about it, but I’d been working steadily on a series of books about a young Robin Hood. They concerned BIG details about the character, such as him learning to fire a bow, light a fire, and survive as an outlaw – things that I don’t think we’ve ever seen before. The trilogy began with Robin’s father dying, which proved problematic as during the writing I found out my mother had incurable cancer. I suppose the story and real life became intertwined in some way, and I found writing about a boy’s feelings concerning losing a parent was a bit too close to the bone. So when I used the word ‘steadily’ to describe my work rate, it was more stop and go. But the publisher and editor were really understanding. Mum died, I grieved, things moved on, and eventually we were happy with book one. Book two, in contrast, was easy to write. It contained a huge battle at the end – one which I thought was probably the most exciting thing I’d ever written. And earlier in 2016, I was close to finishing the final part in the series when I heard that the publisher no longer wanted the books. They were trimming their list. It’s a very strange situation to find yourself in. The cathartic nature of battling through difficult work and finally succeeding in reaching the end was not to be mine. However, I do now sit with an unpublished trilogy of books about Robin Hood growing up in Sherwood. Who wants them? So, that’s Robin out of the way. What else happened? I set up This Book is Funny, which was successful, and is back on the road again for 2016. I travelled the world. I visited the US and China, making school visits and talking about my books. I’ve been back to China once more in this time, and made some terrific friends. I also now know that Pigsticks and Harold will be published in China, which is a wonderful thing. I cannot wait to see how they treat it. 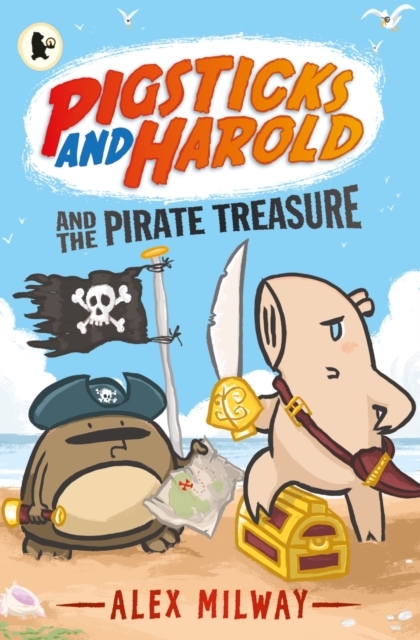 Of course, Pigsticks and Harold have a new book out – Pigsticks and Harold and the Pirate Treasure! We’ve started getting some lovely reviews, and I think this is my favourite of the series so far. Now then, there is much more to say, but that can wait for a bit. Events are coming up, as well as new stories, and I am dead keen to write some ‘How-to’ posts about my model-making. I’ll be doing those soon. So, for now, thanks for reading.